Put simply Asteya means not to steal. 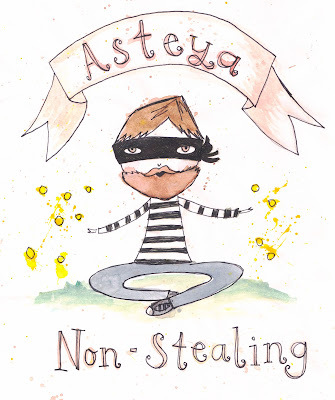 Most of us don’t steal property, so the meaning of Asteya needs to be more nuanced to for our practice flourish. Informed by Buddhism, my personal understanding of Asteya is “not taking that which is not given freely.” This embraces a myriad of life situations and allows us to reflect on the small or larger ways in which we are taking and why. It may be that we are taking someone’s time and energy or we might be taking from the earth. To live the Yama’s we need to find our own personal expression of what each Yama means. This “not enough”, or sense of lack can drive our thoughts, feelings and actions in the world. A feeling of lack or emptiness leads us to look outside of ourselves for fulfillment and wholeness. We seek the approval of others rather than being comfortable in our own skin. Our need for approval from others can lead people deeper into unhappiness and disconnection. Often if we don’t get approval from others the way we want it, when we want it, we throw an emotional tantrum! Sometimes the sense of self is so unstable that without external approval and validation we don’t really know who we are. This begins at an early age with the way children are parented and the forms of validation we use, and then is reinforced at school and in the workplace. For many mimicry becomes commonplace – the “taking’ that Asteya speaks of becomes an adoption of other’s ideas, turns of phrase, way of behaving. This occurs in yoga all the time, and is why we have began to see a lack of diversity in representations of yoga. There is a mould people try fit into for acceptance and validation. It is of course lovely to be celebrated and appreciated by others, but that can not be the basis for our sense of self. The world is a transient place – jobs, relationships, appearances are not enduring. Looking outside ourselves for confirmation that we are indeed enough is the pathway to deep unhappiness and discontent. I have noticed as I get older that for some people they are most comfortable in a space of taking from others, and less comfortable in a space of giving. For some it is the inverse. For me I have had periods where I have given and given until I was too exhausted to give what I wanted to the little people in my life. Upon entering my forties I began to reflect on this pattern and ask myself why I was in so many relationships in which there wasn’t much reciprocity. Why was I available to so many people emotionally over a long period of time who were not friends, family or directly related to my work? Why was I willing to work twice as hard as others? Why was I giving charity to those more financially secure than me? For me the not “enough” was about never being able to give enough – I want to give people I love everything! I ignored the warning signs that certain friendship were a one-way street, which isn’t a friendship at all. As I began to realise the “not enough” narrative underlying this I became more careful about where I placed my energy and time. What has since emerged by reflecting on Asteya is that I have so much more time for everything that is dear to me. I have more time for my family, for my friends – actual friends that you can call to talk and process with any day of night where there is a deep reciprocity, more time and energy for students, more time to mentor the amazing team of teachers at Yoga Space and possibly our family will be more financially secure as we continue to from business losses sustained. I think for each of us there is a “not enough” that drives many of the difficulties we experience in life. Each of us has our own story and of course this is necessary to have a coherent sense of self in the world. Yet we also need to understand from a yogic perspective, these stories can be very unhelpful and are known as Samskaras. They are deep physical, emotional, social, and spiritual grooves that I often speak about in blogs. They are directly related to Patanjali’s goal of yoga – which is to still the fluctuations of the mind. In order to begin to quiet the mind it is essential we understand the way in which we might experience a lack and how that flows into our relationships, work and parenting.